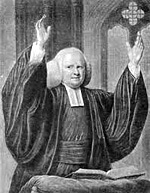 John Newton is the ‘wretch’ who wrote the famous hymn, Amazing Grace. Years ago I wrote a screenplay about his life and hadn’t looked at it in ages – until last night. What an amazing story it is. And what an inspiration it can be to you and me. Newton was born in Kent, England in 1725 to a seafaring father and a God-fearing mother who trained him to read Latin and recite Bible passages by the time he was five. She told people her son would be the finest preacher in England and believed he was destined to marry her friend’s daughter, Mary. Sadly, she died when he was just seven. John’s father remarried and his stepmother sent him away to boarding school where he rebelled against the harsh discipline and begged his father to join him at sea. He got his wish at eleven, but was pressed into service as a cabin boy aboard an English war ship, where more harsh treatment turned him into a trouble-making brawler. After years at sea and many lashes at the whipping post, his heart was hardened. His only ‘soft spot’ was his love for Mary, whom he had gotten to know while visiting home. But it didn’t change his bad behavior, which finally got him booted out of the Navy. John’s answer was to marry Mary, but her father rejected his proposal and ran him off. Hurt and angry, John jumped a ship bound for Italy. 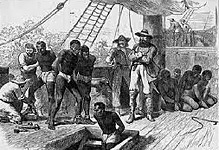 After fighting with crew members he was traded to a slave ship bound for Africa, where he continued to fight and began ridiculing the slave ship captain with cutting rhymes and sarcastic songs. On the African coast John agreed to work for the region’s predominant slave trader, an Englishman with an African wife who instantly despised him. After almost dying from African fever John was abused by the African wife and ultimately framed for stealing. The trader then worked him like a slave, almost to death, before freeing him in disgust. John recovered and began to work and live with other merchants in the area. 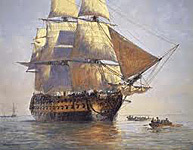 Hopeless about his prospects back in England, he was sure he’d stay in Africa – until a visiting ship reported their ongoing search for John Newton! Once back in England John learns that Mary loves him and has prayed for him every day, but they clash over his plans to captain a slave ship and make his fortune sailing the ‘Golden Triangle’ between England, Africa and the American colonies. His affections thwarted again, he heads off to sea angrier than ever. He becomes a full-fledged slave trader and navigates deadly storms, fevers and slave uprisings, but can’t escape his conviction that God is after his heart. 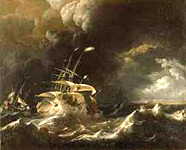 Finally in a storm that almost sinks his ship he cries out to God and is spared. Newton celebrates his new found faith with Mary but they still clash over the subject of slavery, with him defending the widely accepted industry. So he sails away again, but this time, after yet another near-death experience with fever – something that normally kills sailors the first and only time they catch it – he changes his heart on the subject and decides to quit the trade altogether. John and Mary get married and he soon senses a call to ministry. His aspirations are rejected by church officials, however, who balk at his lack of formal training. But he studies and perseveres and is ultimately granted a country church to pastor, where his passionate sermons, real-life experiences and loving nature make him a success. John soon joins a famous poet to write and publish hundreds of hymns in a hymnal that becomes a popular standard for churches everywhere. He later becomes a leading voice to abolish slavery and accepts the call to pastor London’s rich and powerful at a prestigious downtown church, where his spiritual and political influences are maximized. In the year he died (1807), slavery was officially outlawed in England. 1.) Our words can have prophetic power: John Newton’s mother spoke words of life and vision over her son, with many coming to pass over time. Empowered by God’s spirit we can do the same over our own lives and over the lives of others. Scripture tells us that our words steer our lives like rudders on a ship. 2.) Life is an adventure: John Newton’s life path was certainly no walk in the park, but real life is rarely a garden path devoid of detours, zigzags, dangerous drops and reverses. Just look at your favorite Bible characters for proof. We must keep the end in sight and never lose hope when our lives get messy. Keep the faith and embrace the adventure! 3.) Amazing grace in the flesh can change people: John Newton ultimately surrendered to God’s amazing grace, but he saw that grace at work in Mary, whose heart was full of faith and love for him and for all humanity. As children of God this is our high calling, as well. 4.) You can run but you can’t hide: John Newton traveled to the ends of the earth, but he couldn’t outrun God’s grace or calling on his life. And neither can we. The sooner we stop hiding or ‘chasing after the wind,’ and start focusing on God’s interests, the better. 5.) God can use it all: In the end God used John Newton’s unique talents and life experiences – even the horrors of slave trading – for his glory, in an utterly original way. Let’s invite him to use ours in similar ways, for we are God’s workmanship created for good works in Christ Jesus. We thank you heavenly Father for touching John Newton’s life in such a powerful way, and for putting new songs in his heart. Fill us with your amazing grace and all-consuming love so that our lives will bless others and glorify you in amazing ways. In Jesus’ name we pray. Amen! Great story JP, keep it up!